Great place in a great location. Definitely worth the money. 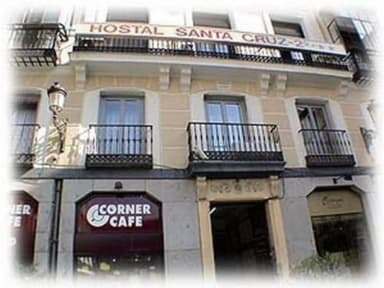 Hostal Santa Cruz is ideally located in central Madrid. It is easily reached from Puerta del Sol. Check-in was quick and efficient, for the rest of our stay we never met personnel, but did not need to do so. Our room was clean and contained the necessary amenities, however, our towels were not changed in 3 days. This is the only negastive mention I can make about Hostal Santa Cruz. Great, clean space. I didn’t give a 5 for facilities because other than rooms they didn’t have much to offer, but it was very clean with very nice staff in a very central are. I would stay here again. Clean ,great location,great staff but can be noisy because it is centrally located however this is easily fixed by earplugs . Great price for a great location! I would highly recommend. Good location, small walk to metro station and tourist buses. Lots of restaurants in 300m, decent prices and good good. Not much English spoken anywhere, be prepared to mime! Room and bathroom clean and comfortable. Small balcony to dry clothes. Wifi worked as did air conditioner!